PeaHen Pad: Kid's bathroom gets an upgrade! 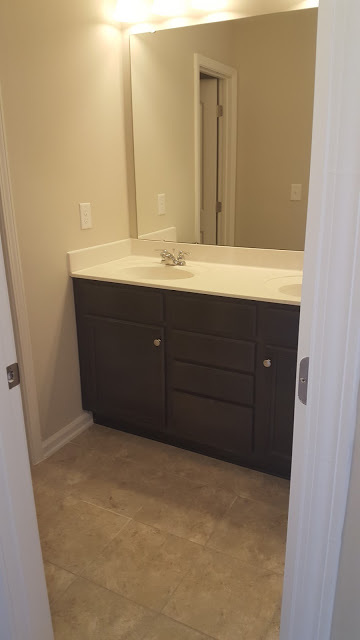 Kid's bathroom gets an upgrade! Sometimes it's just the little touches that can make a big difference. It's so easy to add a few details without overdrawing your bank account or maxing out your credit cards. With a few pieces of wood and some spray paint you can transform the whole look of your bathroom. And with a few extra touches, here's the "AFTER"
Ok, well it's not the total "AFTER" because I need to add some more art and drawer pulls to those cabinets but it's way better than the Before in my opinion. We didn't have to do much. I did end up totally painting all of the walls. 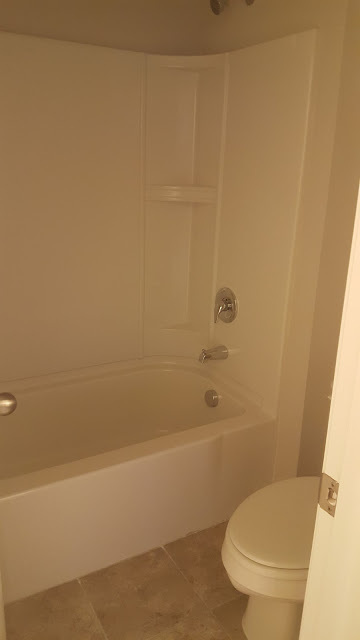 The builder grade paint (flat paint) was not suitable for a bathroom. It absorbed water splashes and doesn't clean well when scrubbed. You can literally scrub the paint right off of the walls. So we chose to paint the walls white in a Satin finish. Next my awesome Joe framed out the mirror using 4 pieces of 4" wood that we stained a dark mocha color. We took down the light fixtures, removed the glass shades, painted them with Oil Rubbed Bronze spray paint and added vintage light bulbs for a cool industrial look. Inside the bathtub area we installed three shelves out of 3 simple wooden boards that we also stained a dark brown. These were going to be floating shelves, which normally are easy to install but the studs in the wall were wonky so we had to use brackets we had lying around. This was the same shower curtain we used in our old bathroom and the rod was above our washing machine area in the old house. Zero dollars spent, yay. The bathroom had one silver towel bar over the toilet when we moved in. Queue the "wah wah" sound. Kids and towel bars don't mix. Have you ever noticed when kids try to hang their towels over a bar they end up pulling on them so hard they yank the bar right off the wall? Well my kids did that and we were so over it. An easy solution is to get hooks instead. Attaching them to a wooden plank makes attaching it to the wall a cinch since you can anchor it directly to the studs and still have even spacing of your wall hooks. So there you have it. Quick and easy solutions for taking a bath to the next level on a dime. Stay tuned for more updates once we add some art and drawer pulls.